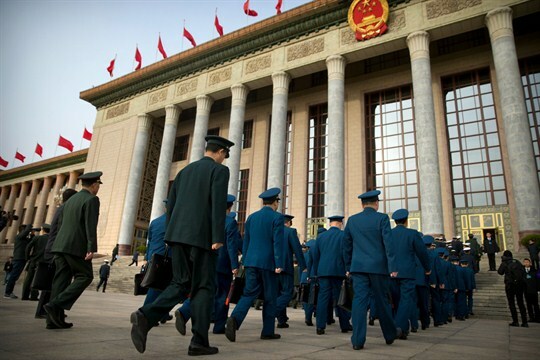 Military delegates arrive for the closing session of China’s National People’s Congress at the Great Hall of the People, Beijing, March 20, 2018 (AP photo by Mark Schiefelbein). Measures announced last month at China’s 13th National People’s Congress to strengthen the leadership role of the Chinese Communist Party and remove term limits for President Xi Jinping have raised fears about the increasingly authoritarian trajectory of Chinese politics. However, given the country’s immense economic and governance challenges and the realities of its political system, authorities have little realistic alternative than to rely on the Communist Party’s leadership to oversee difficult structural changes. While repression may well increase and the possibility of policy misjudgment cannot be ruled out, boosting the party’s influence also increases the chance that Beijing will fulfill badly needed reforms concerning governance and the economy, moving one step closer to achieving Xi’s “China dream” of national revitalization.